Matt pretends to drown in the pool and Lee isn't happy about it. Lee starts to stomp off and Matt follows her. He can't understand what the problem is but Lee won't tell him. Nick comes back, surprised to see Lee's mood. Bronwyn is going out with Melanie tonight, but she's still missing Henry. She hopes she'll be able to snap Melanie out of her boyfriend blues. Harold comes in and Madge says she's got a surprise for him - it's something she's always wanted. It's a sauna by the pool! She's only hired it though, so they can try it out. Beverly is changing Rhys's nappy and looking worried. 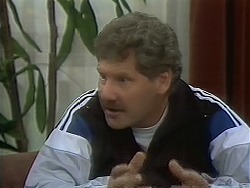 Jim comes in and tells Beverly that he had to go to the police - they couldn't put up with blackmail. Beverly thinks that they're going to lose custody, but Jim points out that they have legal guardianship. But Beverly says tearfully that Deborah can get him back through the courts and then put him up for adoption - meaning they'll lose their baby. Nick and Matt are playing cricket and talking about Lee. Matt can't understand what's got into her. Just then they hear a noise and peep over the fence to see Madge and Harold skinny-dipping(!) They dissolve into laughter. Jim tells Beverly that they'll see their lawyer tomorrow and see where they stand. Nick and Matt come in giggling and tell Jim and Beverly about the skinny-dipping. Jim immediately starts off to peek, but Beverly stops him saying Madge and Harold are entitled to their privacy! Jim goes off to peek anyway, and Beverly chases after him. Bronwyn tells Madge that she had quite a good time last night, but Melanie was still a bit down. Nick asks Lee what happened yesterday afternoon, but she doesn't want to say. Nick advises her not to shut Matt out. There's a knock at the door and it's Des's boss. 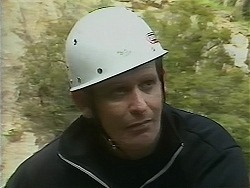 He's really excited about the abseiling, but Des is pretty stressed. His boss tells him that abseiling is important - it helps him see which of his staff have management qualities! Matt is hitting some notes on the piano when Lee comes in. She's come to talk to him about yesterday afternoon. She apologises for yelling at him, saying that she got into trouble in the sea once, and nearly drowned. She was rescued by the lifeguards, but her boyfriend, who swam out to help her, drowned. Matt hugs her. 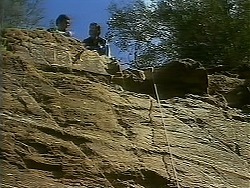 A bloke is demonstrating abseiling to Des. His boss is banging on about how controlled risks are part of the stock-market, just like abseiling. Then he says that one bloke he brought up here didn't even make a jump - he's working in a bank now(!) Des resolves to give it a go. Beverly is still worried about Deborah, even though their solicitor doesn't think Deborah will go through with her threats. Madge and Harold call round to invite Jim and Beverly to use their sauna. Jim and Beverly exchange looks and try not to laugh. They try to make excuses to get out of it and eventually Jim lets slip that the kids saw them last night. Harold is very embarrassed but Madge starts to laugh. Des is all kitted up for abseiling although he is stalling a bit. He goes to the edge of the cliff and tries not to look down.